I'm going to try to keep a running list of all custom kernels as they become available for Verizon's Galaxy Nexus. I'll do my best to check other forums for releases and updates, but if you notice a new release or update that I've missed, go ahead and note it here and I'll make the changes to the OP as time permits. Hopefully this will help us all keep CDMA/LTE releases separate from GSM releases, as a lack of good description has already caused some problems. I'll put links to both the kernel's original release thread, and our local thread if we have one. Please try to keep this thread free of individual kernel questions, troubleshooting, or general discussion so I can find posts about new kernels and updates as easily as possible. Refer to our local thread for discussion, or go ahead and start one in the Kernels section if one doesn't exist. Please note that some of these kernels are lightly tested and may have been released on an experimental basis. Many have adjustable settings and can be temperamental at times. Because each phone handles kernels differently, what is right by one phone/kernel combination may not be right by another phone/kernel combination. Kernels are often ROM/base specific. Be sure the kernel you're choosing is compatible with the ROM it will be partnered with. Please be completely informed before continuing to modify your device, and ask any/all questions in the proper location (not here) if you aren't sure. You and you alone are responsible for any damage incurred by flashing these files to your Nexus. **NOTE** Some links contain downloads for both CDMA/LTE devices and GSM devices. Some files also work for both phones. Be certain you've selected the file that is right for your device. 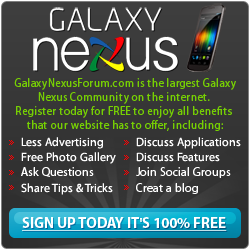 See this thread for a list of CDMA/LTE Galaxy Nexus ROMs. Last edited by bhfd64; 03-10-2012 at 04:19 AM. wicked, paul_gyver, Garemlin and 7 others like this. I'll add it when I get to a PC. Thanks! lets get this thread marked! Meaning what? It's already stickied. Every single one of these are 4.0.3 kernels. Any are there any lists of 4.0.2 kernels, Colonel?